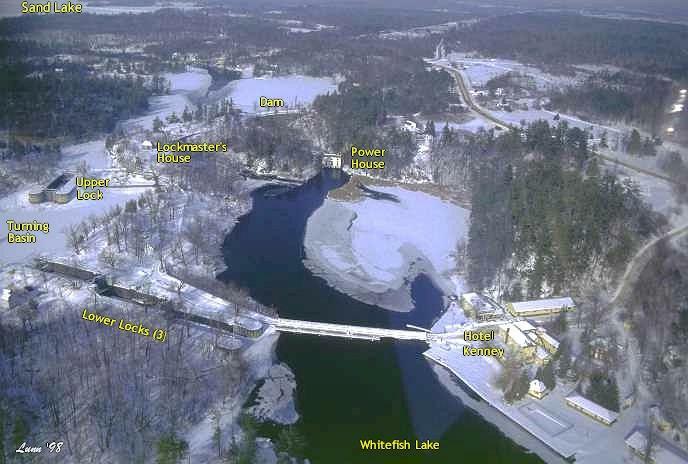 It can be seen from this photo how Colonel By managed to bridge the elevation difference between Sand Lake and the Whitefish River (now Whitefish Lake). By placing a dam at the site of the falls (at the time, the highest dam in North America), he stopped the water flow through the falls and raised the water level in Sand Lake to ensure a safe navigation channel to Davis Lock. The lock at Upper Brewers Lock (several kilometres downstream) was also designed to raise water levels, turning Cranberry Marsh into Cranberry Lake and Whitefish River into Whitefish Lake. The water level in Sand Lake is now controlled by the Jones Falls dam and a weir located just behind the lockmasters house (between the dam and the lockmasters house). The four locks at Jones Falls lift boaters at total of 17.8 metres (58.4 feet). Jones Falls remains one of the finest examples of 19th century engineering and as a bonus, it is also one of the prettiest lockstations on the entire Rideau waterway.